#TheBurgCares campaign focuses on St. Petersburg with information about testing, treatment and overcoming the HIV/AIDS stigma. 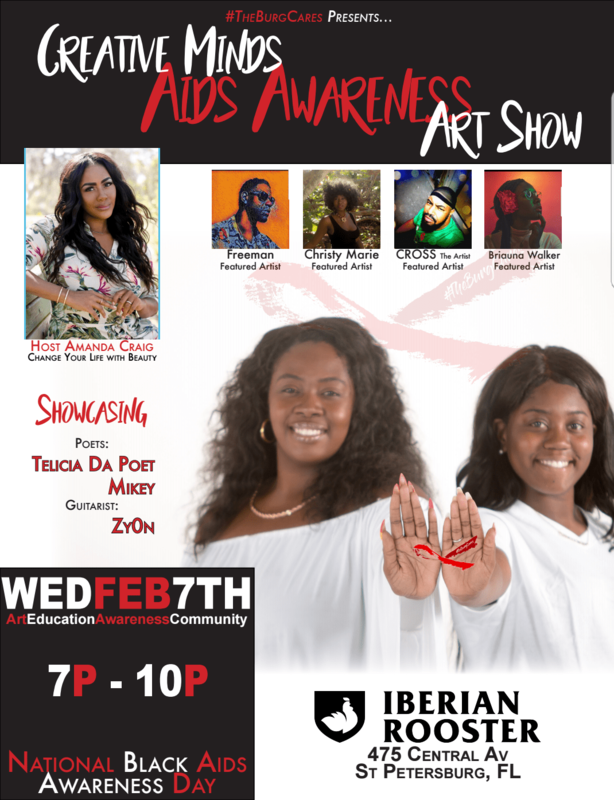 ST. PETERSBURG – To highlight National Black HIV/AIDS Awareness Day, #The Burg Care is hosting a free art show Wednesday (Feb. 7). The event, Creative Minds AIDS Awareness Art Show, will feature art and photographic displays from local celebs in the black community from 7 p.m. to 10 p.m. at the Iberian Rooster, 475 Central Ave. in St. Petersburg. Metropolitan Charities will be on site to provide no-cost HIV testing and education to attendees. According to the Centers for Disease Control and Prevention, Blacks/African Americans are the racial/ethnic group most affected by HIV in the U.S. In 2015, African Americans accounted for 45 percent of HIV diagnoses, though they make up 12 percent of the U.S. population. #TheBurgCares is a local HIV/AIDS social media campaign that was launched in November through a Pinellas County government grant and the Florida Department of Health in Pinellas County’s HIV/AIDS Program. The campaign focuses on St. Petersburg – commonly called “the Burg” – with information about testing, PrEP, treatment and overcoming the stigma of HIV/AIDS. #TheBurgCares is on Facebook, Twitter, Instagram and also targets high-risk populations on select dating sites. #TheBurgCares event will honor NBHAAD and provide an opportunity for the people of St. Petersburg to appreciate the art of getting educated, involved, tested and treated. Since 1999, NBHAAD has aimed to do just that. This February marks the 18th year for the national observance. For information about #TheBurgCares, go to facebook.com. For information about DOH-Pinellas, go to PinellasHealth.com or follow at @HealthyPinellas.